HENRY, ANTHONY (also Anton Heinrich or Henrich), printer and publisher; b. 1734 near Montbéliard (France) of German parents; d. 1 Dec. 1800 in Halifax, Nova Scotia. Little is known of Anthony Henry’s early life, but he probably served a regular apprenticeship in the printing trade in Europe. He was proficient in English, German, and French. In 1758 he served with the British forces as a regimental fifer at the capture of Louisbourg, Île Royale (Cape Breton Island). It is believed that after his discharge Henry worked in a New Jersey printing office for two years. He then joined John Bushell*’s shop in Halifax. He was made a partner in the business on 23 Sept. 1760 and assumed control of it after Bushell’s death in 1761. Henry continued the publication of the Halifax Gazette, but his business was mainly government printing and stationery. He worked closely with the provincial secretary, Richard Bulkeley, who had been responsible for the editing of the Gazette since 1758, and with the administration’s financial support he gradually succeeded in improving his equipment and expanding his business. In the autumn of 1765 Henry hired a young apprentice by the name of Isaiah Thomas, and on 21 November, presumably with his employer’s knowledge, Thomas published in the Gazette a paragraph indicating that the people of Nova Scotia were opposed to the Stamp Act. Government officials were incensed, and when the Gazette continued to comment on the act Bulkeley withdrew the administration’s patronage. The newspaper ceased to appear some time between March and August 1766. Henry was succeeded as government printer by Robert Fletcher, who began the semi-official Nova-Scotia Gazette. Three years later Henry founded the Nova Scotia Chronicle and Weekly Advertiser, the first Canadian newspaper to run independent of government patronage. The Chronicle presented a variety of the “freshest Advices both Foreign and Domestic,” as well as essays excerpted from European and American publications. Henry somehow managed to obtain the proceedings of the House of Assembly, which he printed seriatim, and this feature must have appealed to a politically conscious community. The Chronicle contained few advertisements, and its survival was perhaps partly the result of its consistent support for the Whig position. Henry may well have had financial support from Whig sympathizers. In 1770 Fletcher’s publication was absorbed by Henry’s more popular newspaper to form the Nova-Scotia Gazette and the Weekly Chronicle. In the same year, probably because he was the one skilled printer with presses in Halifax, Henry resumed publication of government documents. His newspaper, renamed the Royal Gazette and the Nova-Scotia Advertiser in 1789, lasted for 30 years and became more an outlet for official information as his political preference for the Whigs diminished. In 1788 Henry was officially commissioned king’s printer, an appointment which removed much of the uncertainty in his contract with the government. His commission is one of the earliest and most important documents in the history of Canadian publishing. After receiving it Henry became noticeably cautious and avoided controversies that might jeopardize his official position. 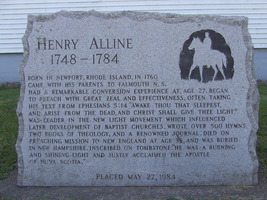 Besides many government documents and the Nova Scotia statutes, Henry published some of the religious works of the celebrated evangelist Henry Alline, and almanacs such as The Nova-Scotia calender . . . and Der Neuschottländische calender . . . . The Nova-Scotia calender for 1776, with its wood-cut engraving of Halifax harbour, was the first Canadian book to contain an illustration. A total of some 200 items, not including newspapers, which bear Henry’s name or are attributed to him, are listed in Marie Tremaine’s Bibliography of Canadian imprints. By the time of his death the position of king’s printer had gained considerable stability and authority as a result of his consistent work. His technical skills improved over the years, but his productions never reached a standard of uniformly good printing and design to match that of Fletcher or of John Howe*, his successor as king’s printer. Mainly on evidence provided by Isaiah Thomas – whose account of his sojourn in Halifax is, however, generally looked upon as unreliable – it is said that around 1761 Henry married a black pastry cook who owned some property and with whose financial help he was able to purchase Bushell’s press and also to build a home where they lived until she died two or three years later. On 23 Feb. 1773 Henry was married to Barbara Spring, a widow 15 years his senior. In 1780 Margaret Greese, whose maiden name may have been Miller, became his third wife, and she survived him by 26 years. One daughter is known to have been born of this marriage. Socially Henry mixed with the German element in Halifax and at one time was a warden of the little Dutch church (St George’s). He was the godfather of Anthony Henry Holland*, who became an important publisher in Halifax. There is a portrait in crayon of Anthony Henry in PANS. N.S. Legislative Library (Halifax), N.S., Lieutenant Governor (Parr), commission appointing Anthony Henry king’s printer of the province of Nova Scotia dated at Halifax, 8 April 1788. Tremaine, Bibliography of Canadian imprints. Bell, Foreign Protestants. Brebner, Neutral Yankees. Æ. Fauteux, Introduction of printing into Canada. H. P. Gundy, Canada (Amsterdam, 1972). Isaiah Thomas, The history of printing in America, with a biography of printers, and an account of newspapers . . . (2nd ed., 2v., Albany, N.Y., 1874; repr. New York, 1972). J. J. Stewart, “Early journalism in Nova Scotia,” N.S. Hist. Soc., Coll., VI (1888), 91–122. Douglas G. Lochhead, “HENRY, ANTHONY,” in Dictionary of Canadian Biography, vol. 4, University of Toronto/Université Laval, 2003–, accessed April 22, 2019, http://www.biographi.ca/en/bio/henry_anthony_4E.html.